In Israel it's all about the sweet, beautiful donuts at Hanukkah time. 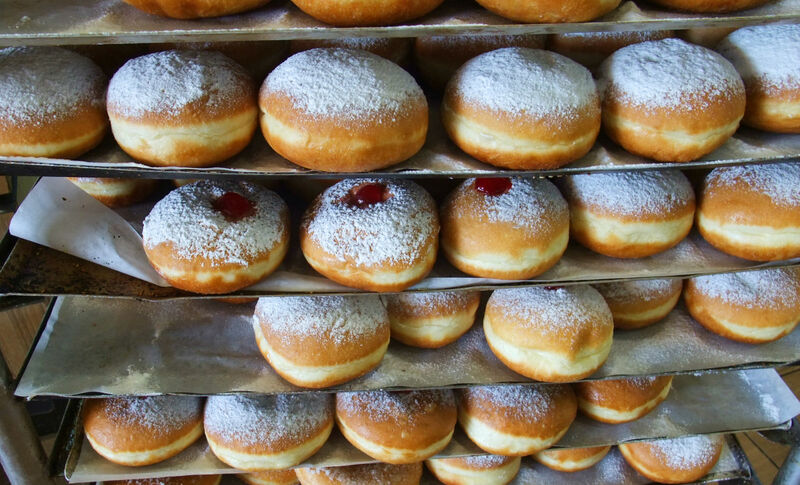 The 2017 Hanukkah season began in Israel weeks ago, and by the holiday’s end food establishments will have sold millions of sufganiyot, donuts, ranging from the classic to the unexpected. While the tradition of eating sufganiyot is growing in popularity in the United States, fried potato or other root vegetable pancakes (aka latkes) are the most frequently eaten Hanukkah food here. But in Israel, Hanukkah and sufganiyot are synonymous. It wasn’t always that way. According to Gil Marks’ Encyclopedia of Jewish Food, sufganiyot became the Hanukkah food of choice in Israel before the state was established, beginning in the 1920s. The Histadrut, the Israeli labor federation, saw in the fried donut a job opportunity for the underemployed masses living in what was then Palestine. Since latkes were easy to make at home and sufganiyot far more complicated to prepare, the idea was to put people to work preparing, transporting and selling these yeasty delicacies. The push to make and sell them started weeks before the first night of Hanukkah, thus extending the holiday season and the work opportunities the donuts engendered. Within short order, the sufganiya outpaced the fried potato pancake as the culinary symbol of the eight-day holiday and an industry was born. Almost 90 years later, sufganiyot are ubiquitous in Israel. They are sold in supermarkets, restaurants, bake shops and open-air food markets. Angel Bakeries, the largest commercial bakery in Israel, purportedly fries more than 250,000 sufganiyot during each day of the holiday. 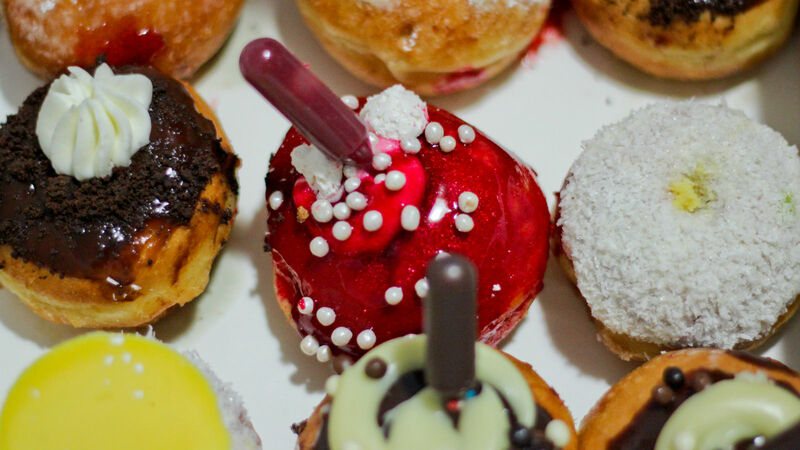 And while most of the donuts sold in Israel are the classic type, filled with some sort of jelly, the race is on to come up with the most creative, delectable, unusual confection possible. The Showroom Bakehouse on Rabin Square in Tel Aviv sells a s’mores donut, filled with chocolate mousse and marshmallow. The well-known bakery chain, Roladin, rolls out a new palette of jelly donuts each year, so beautiful that they look like edible art. The 2017 selection of Roladin sufganiyot included a “meringue cheese cake” donut filled with a mango-pineapple cream and topped with white chocolate and whipped cream, a “red kiss” donut filled with a red fruit cream and topped with mascarpone, meringue kisses and berries, and a “green queen” confection filled with a white chocolate and pistachio cream and covered with a pistachio glaze. This year’s collection includes 12 varieties, from the classic to the artful. And if you are looking to save calories? Then try one of the sufganiyot that eschew oil. The bakery Lachmanina, with two shops in Tel Aviv, sells brioche-type donuts that are baked and NOT fried. Same is true for Boutique Central, a chain of kosher pastry shops mostly in the Tel Aviv area. These bakeries seem to be fine with staying with the food and losing the oil. That may not be in keeping with the oil-centric holiday, but their customers don’t seem to mind. And for the vegans among us (since Tel Aviv was recently dubbed the vegan capital of the world) vegan options are available even in the world of sufganiyot. The bakery chain, Piece of Cake, offers a selection of six vegan donuts like the double jam donut or the halvah-glazed variety. Each year, local media outlets list the best and the tastiest of that year’s selection of sufganiyot. The flavors know no bounds. The next time you visit Israel in December, consider a sufganiyot-based food tour, one that brings you to a new bakery and donut filling each day. Healthy ways to recover from eight nights of latkes and donuts.